Welcome to THE NEXT BIG THING blog tour. Many thanks to the wonderful Stacey Joy Netzel who tagged me and I’ve tagged another writer at the bottom of this page. It’s called Run Rosie Run and it’s the third book in the Ludlow Hall series. Rosemary Margaret Gordon is the best friend of Bronte Ludlow (now Mrs Nico Ferranti, lucky girl) from the first book in this series, Reckless Nights In Rome. Rosie’s character grabbed readers so much they demanded her own story. Luckily for me I was already writing her. Just this week I found handwritten notes/scenes with Rosie and Alexander dating from January 2011. So she’s been living with me for quite some time. It comes under the wide spectrum of Contemporary Romance. I write fast paced romantic fiction with authentic and valid emotional conflicts. They’re quite hot and steamy since the stories reflect the moment when two people fall deeply in love and physical attraction is a big part of that in real life. This is such a difficult question because I never have anyone in mind when I start writing characters. But the model on the prototype cover is definitely Rosie and my readers agree. Alexander might be a smoother, taller version of the British actor, Jamie Bamber. She’d wasted enough of her life in love with a man she could never have and the time had come to give another man a chance, but now Rosie has two men who will stop at nothing to win her heart, which one will she choose? I’m self-published by More Press. The freedom to write in two genres, Contemporary romance and Paranormal romance under the subheading of vampire fiction, is a gift. From memory, I’d say about eight weeks in total. But I never work on one book at a time, I work on three or four. At the moment the book’s in the hands of my betas. I’m already halfway through a first draft of book five in the series, the story of Coco Monroe. After Rosie comes the story of Justine and Joshua. Perhaps Bella Andre’s family sagas? It’s hard because I don’t compare my writing to anyone else. I try to write what I want to read and can’t find. It’s always been a secret dream of mine to write a romance. My first love is paranormal and I’m a big fan of JR Ward, Christine Feehan, Nalini Singh and Sherilyn Kenyon. Those girls rock. However, I also have a love affair with the contemporary romance girls including Gemma Halliday, Bella Andre, Ally Blake, Kelly Armstrong and India Grey. It might surprise them, in a good way, lol! So, interview over, I am now going to tag the fabulous J. Lawrence with the same ten questions. John’s post will be up on the 4th of December! 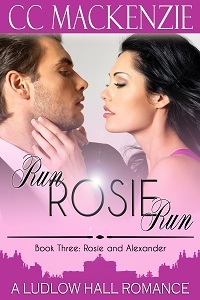 This entry was posted in RUN ROSIE RUN, The Next Big Thing and tagged blog, cc mackenzie, contemporary romance, relationships, romance, Run Rosie Run, The Next Big Thing, writer, writing by CC MacKenzie. Bookmark the permalink. “She certainly sounds like a riveting character,” he said, knowing that when a joke falls in a forest with no one to understand, it indeed makes no sound at all. LOL! Hmm, she’s doing a good job of emasculation at the moment. Sigh. I feel a rethink coming on. Sounds like another sizzler! Congratulations CC! Sounds like a fun book! Thanks for sharing, CC! Hi Jennette. It will be fun when she’s finished!